Lynn Wagner K7WGR mentioned you were interested in old radios and just acquired an Airline which was pictured on your website. The radio looks great and is in good condition. It should be very easy to restore. I’ve recently gotten bit by the radio restoration bug and have been restoring several bakelite radios over the past few months. Doug Semple KE7GYY also restores old radios and has been doing it for many years. Maybe we have enough folks involved in the Helena area to start our own restoration club! There is a lot of good information on the web to provide information and resources. Here are a few sites I’ve found that I like. Your radio probably has a model number on a label somewhere. If it does, you can look for the schematic on these websites http://www.nostalgiaair.org/ and http://techpreservation.dyndns.org/. If you can’t find the model number there are a number of sites that have good photo galleries to help you identify your radio, http://radioatticarchives.com/ has a very large gallery of Airline radios and http://antiqueradios.com/ has a nice gallery also. A good site for general information on electronics restoration and a source of e-caps, resistors and small capacitors is http://www.justradios.com/. A good site for Old New Stock (NOS) tubes and good used tubes is http://stores.ebay.com/Daves-Radio-Shop. I have one Airline radio. It’s a 1950 model 1527 and is shown on the radio attic archives site. I found it at the Good Sam Thrift shop. My Airline isn’t as classy as your! If you need any more information or help, let me know. This was welcome GroundHog Day reading this very cold February 2nd (2010) in Toronto, Canada. I got my start in SWL with a radio quite similar to this, but line-powered. I collected many QSL cards from the Caribbean & South America using the old SW tube set and a roll of electrical wire strung between apple trees in my backyard. I’ve never seen one with 1.5 V tubes like yours altho in Grade 8 I did have an early portable tube radio that had a D-cell & 1.5V tubes with a 22.5 V “B” battery for the plates. Please keep up your blog & posts, very interesting, and I’ll be back. By the way, I’ve been to Montana and it is a beautiful state. Thanks for the posts Rod. This site has just been hacked and I just got it restored from the backup a few hours before you made your posts, so sorry for the delay getting back to you. I am a very “amateur” old radio collector and like to acquire them when they come along my path at a good price. police band radio. Series 07A W.G. 24 in Denver Colorado. Any info you have on this unit would be greatly appreciated. Sorry, As I have said before, when I come across a good deal at a garage sale or somewhere, I buy a radio I can afford. I have no idea how much things are worth. I grew up listening to several ward airline radios. I am in then process of restoring model # 04BR-730a . Can you suggest where I might find knobs for this model. Also is your radio for sale? Google “antique radio” and you might find some place to find parts. Sorry mine is not for sale. Have fun restoring your radio. I have an old wards airline radio I would like to sell. don’t what year, but it looks pretty old. needs refinishing and some tubes. Won’t guarantee that it will work, just bought it for a conversation piece. Your reply appreciated. hi i am trying to get some details about a montgomery ward radio . i have just obtained a leatherette case model with the # wg- c series 15bd11-917. it is a case which latches from the top and then lays on its side when the top is opened to display its dials and speaker. at the top of the label it says article 62-1 with the rest of the numbers not there. i would like to know the model year and any other details. i would appreciate any help you could give me in this venture. by the way i have a fairly large collection of antique radios . this one makes 45. they go from 1925 -1952. thank you in advance for reading my request. I am sorry, but I have no information. I am a very much amateur collector and when I see something I can afford that looks nice I buy it. I don’t really have any knowledge about them. No thanks. But thanks anyway. I have the exact radio. It has been in my family for years. It was my grandmothers. I was looking for information on this particular radio, and came across your post. Mine still works, and we are able to pick up signals from foreign countries. What can you tell me about this radio? How old is it, and what is it’s worth? I have an Airline am radio model #64BR-1503B missing one tube it worked before tube got busted. Cool stuff ! 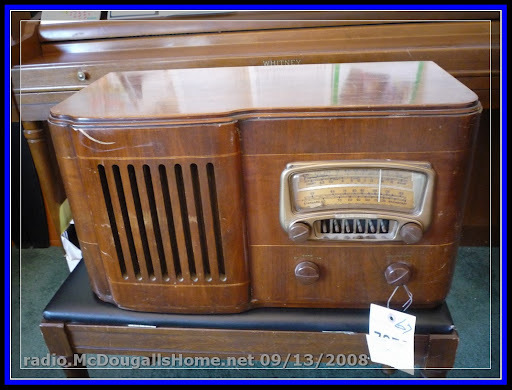 I have an Airline Radio Model 8a47 it is pictured on this Web Site. I am looking for replacement knobs for this model. If anyone knows where I could purchase ..please let me know. Looking for replacement knobs for Airline Radio 8A47. Please let me know if you know where I can obtain. I have an Airline ENCHANTER that I can’t find a schematic for it. I have a Ward Airline Radio model 93BR-420B series B Brown . 105-125 Volts A. C. (50/60 cycles) or D. C.
I have no Idea how old it is or what it is worth. Could someone please give me some info on this model?? Rick Peterson, I have an Airline 84KR2510A Nightstand Radio that belonged to my grandfather. The tuner knob will not move back and forth for the volume knob still works. It’s picking up a station but has a loud hum due to the old tuning bulbs. The casing is in beautiful shape as my Dad has refinished it. I would love to know how much it’s worth as well. If you find any further information, please let me know. I have a Montgomery ward radio, bought around 1951, black, tube operated, works fine, used as a kid to get foreign stations, was into shortwave radio at the time. Bought with news paper income. wonder if anyone interested in the radio? I have a Montgomery Wards Airline transistor radio model 1215,(that’s what’s on the pamphlet that came with it), It is in the original box and has the original battery in it’s original box. Can anyone tell me what the value might be? I can text a photo. I received this when I was ten or eleven, I’m 67 now. Looking for information on a airline super heyeroyme radio Serial #IF456KC, Model 62-311. Series- OEL Can you tell me what it would be worth. Thank you. I have an old Wards Airline Radio. 7L553942. I am not asking for value. I just want guidance on what I have and what not to do with it. My farther had it as a boy and that’s all I know about it. Airline transistor model 1215, original box, battery.